Planning to fish? Buy your Coastal Recreational Fishing License online or from a license agent. 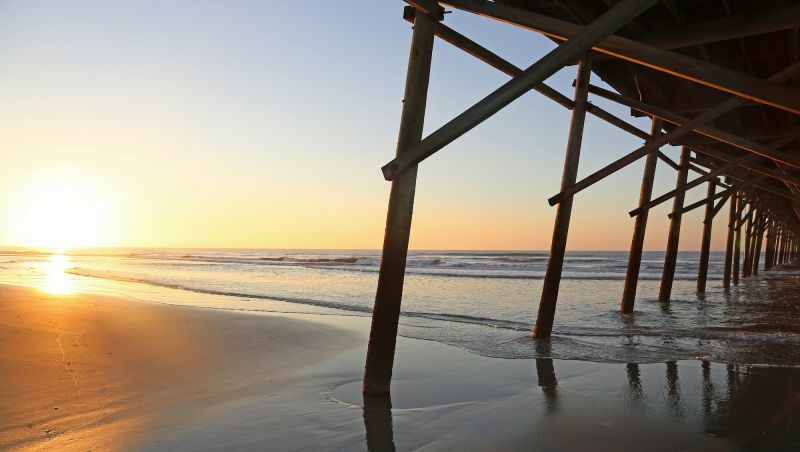 North Carolina’s 300 miles of coastline is dotted by more than a dozen piers offering a range of water-based activities. Proximity to the Gulf Stream means great pier fishing, and additional attractions range from an aquarium to tons of dining options. 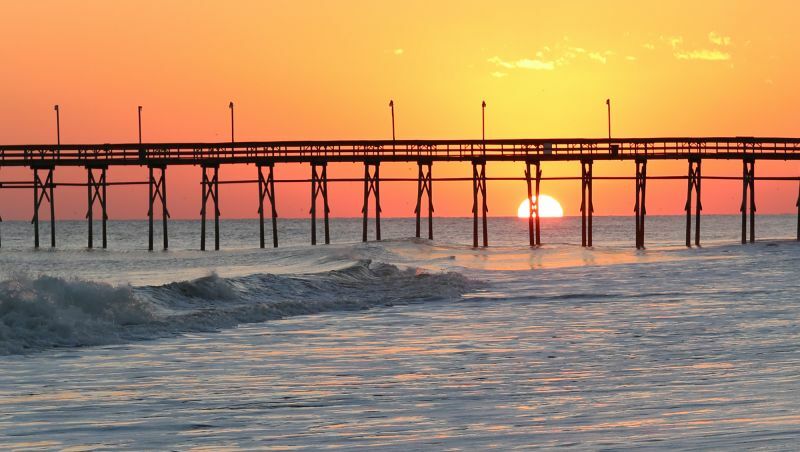 Avalon Pier is 696 feet long and, like most North Carolina piers, features a full tackle shop, bait, rentals and snacks. Its irreverent website is packed with information about fishing and more at the popular pier. 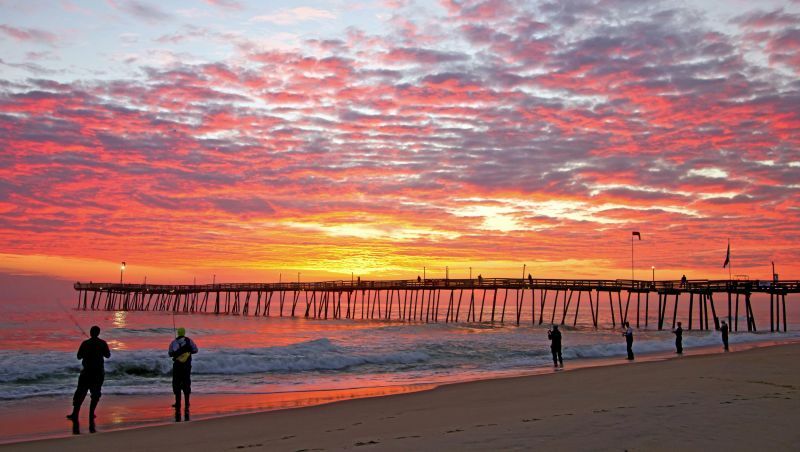 At 750 feet, Nags Head Fishing Pier is one of the state’s longest and oldest piers. With pretty ocean views, Pier House Restaurant – “You Hook ‘Em, We Cook ‘Em” – is definitely a highlight. 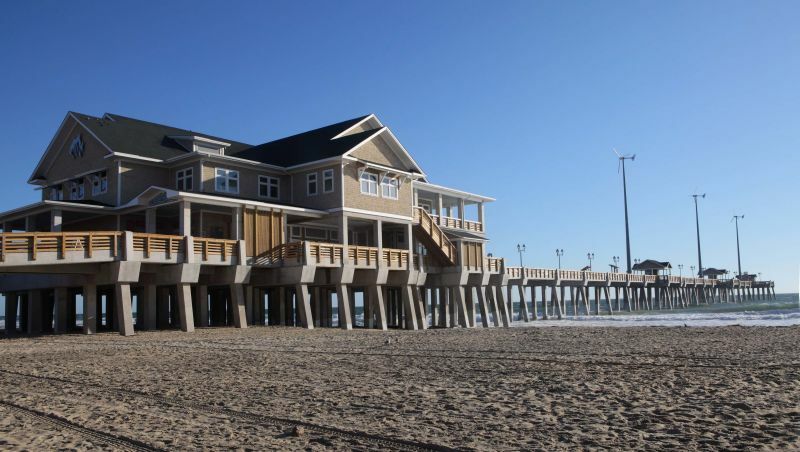 Originally built way back in 1939, Jennette’s Pier was rebuilt after Hurricane Isabel. The groundbreaking concrete structure is 1,000 feet long and includes an outpost of the North Carolina Aquariums network, with aquariums, displays, programs, fishing classes and more. Fishing Unlimited’s 600-foot pier is the closest pier to fabled Oregon Inlet. Along with a full tackle shop, there’s a popular and tasty oceanfront grill. With repairs and additions making it better than ever, 700-foot Rodanthe Pier on Hatteras Island remains a classic Outer Banks fishing pier. Also situated on Hatteras Island, Avon Fishing Pier is about 600 feet long. Anglers aren't required to buy a license to cast a line for red drum and other fish here. Visit the Pier House store for supplies, snacks and souvenirs. 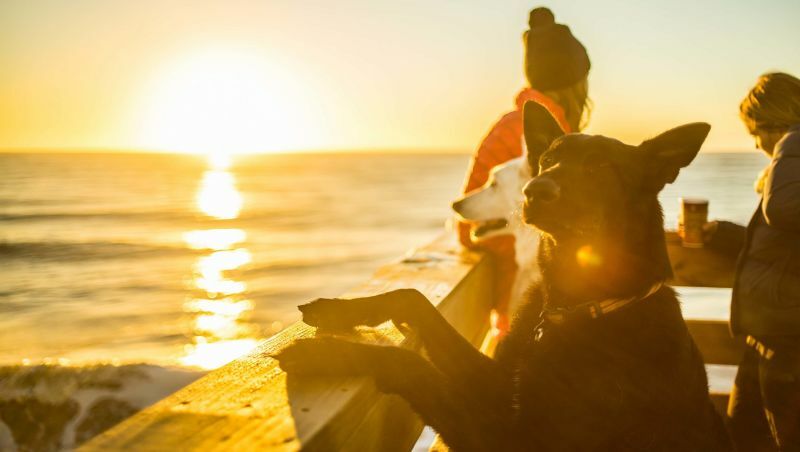 Originally built in 1948 and owned by the Lore family since 1973, 937-foot Surf City Pier features two large fish-cleaning stations, a grill and ice cream shop, outdoor dining and a Pier Kids program that teaches children about fishing and more. The Jolly Roger includes the 850-foot pier, an oceanfront inn and the waterfront Jolly Roger Grill. Bonus: The Karen Beasley Sea Turtle Rescue and Rehabilitation Center is just 8 miles away. Once known as Salty’s Pier, 1,000-foot, family-owned and -operated Seaview Fishing Pier features a full-service pier store and a popular restaurant where they’ll cook your caught and cleaned catch. This iconic 1,200-foot pier offers a full tackle shop, snack bar and game area. It's the only concrete fishing pier in North Carolina and features beautiful views right in the heart of Wrightsville Beach. 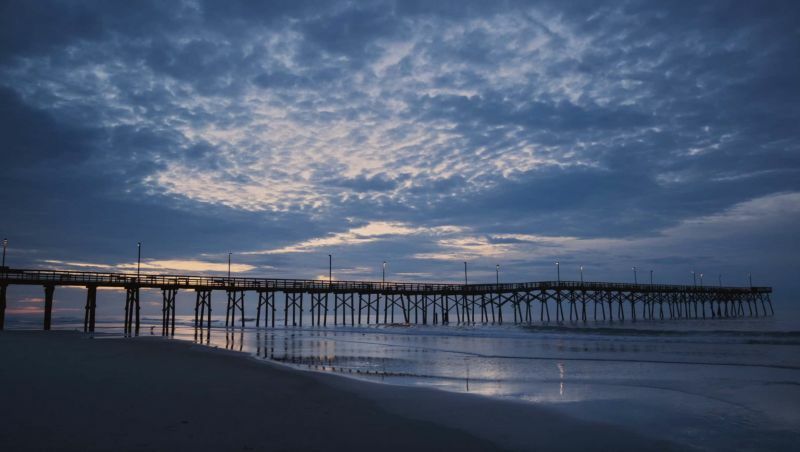 Located at the northern end of Carolina Beach, this 700-foot pier features a small restaurant and a tackle shop with a variety of tackle and baits, although the pier is currently closed for repairs. Built in 1923 and known as the Atlantic Ocean’s oldest pier, Kure Beach Fishing Pier is 712 feet long and features a tackle shop, grill and an arcade with pool table. A license isn't required to fish at this family-friendly pier, but please note alcohol is prohibited. Oak Island Fishing Pier has a full-service pier shop and tasty Flying Fish Café. 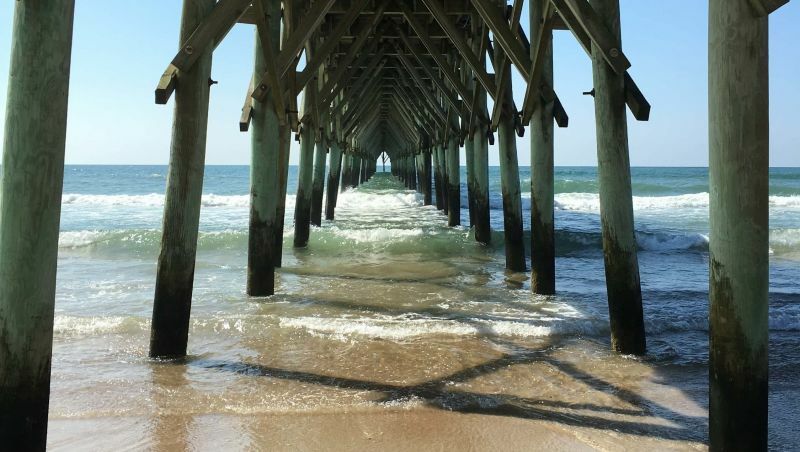 At 27 feet high, it’s currently the tallest ocean fishing pier in North Carolina. Family-owned 893-foot Ocean Crest Pier features a full-service tackle shop and is conveniently flanked by Ocean Crest Motel to the east and Island Way Restaurant & Bar to the west. Situated in the heart of quiet Holden Beach, the 700-foot pier features live bait, a tackle and gift shop, and grill and snack bar. Alcohol is neither sold nor permitted on this pier. This 960-foot pier has a tackle shop, a grill, and a game room for kids and kids at heart. The island’s 900-foot pier includes a fully stocked tackle shop and convenience store, billiards, and a bar and grill. It’s North Carolina's southernmost ocean fishing pier.